Hi all, it's Gwen - back with the June edition of Gwen's Gems! This month I was inspired by the gorgeous work of contemporary ceramic artist Neil MacDonnell. 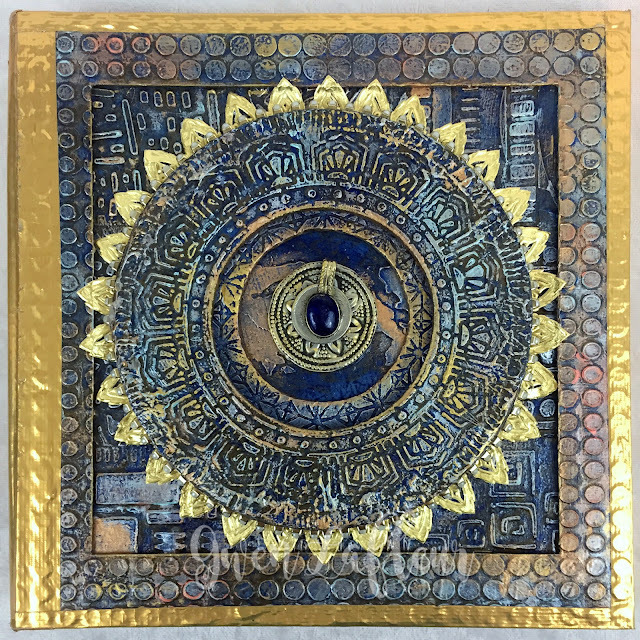 He did a series of beautifully textured and layered square and circle compositions that really spoke to me. As I looked at them, I decided to use these pieces as my inspiration for a heavily textured piece that had some clearly defined layers. As I worked, it became clear that this needed to become a book cover for a new art journal, so that's what I did! 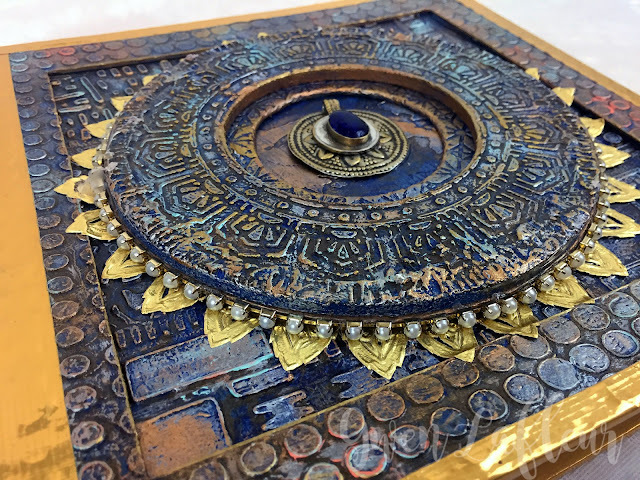 Here's how I took this inspiration and made it my own using stencils, lots of molding paste, chipboard, cardboard, and a few other supplies. 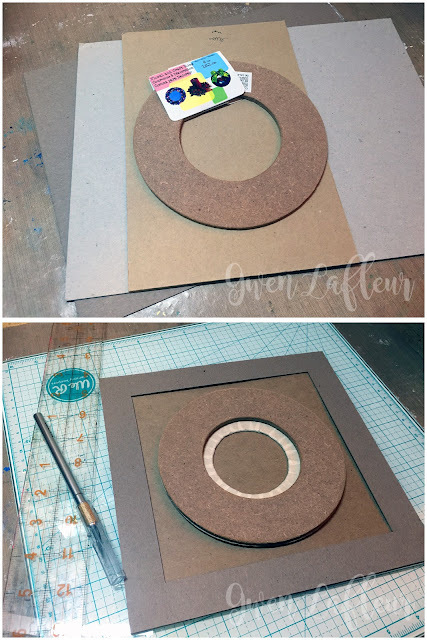 First, I decided what pieces I was going to use to create the layers - I found some different weights of chipboard, some very thin cardboard, and a wooden floral ring that I'd picked up in the clearance aisle at the craft store, just knowing that I could use it for something. Since it was the one thing I couldn't really change, I used the wood ring to determine the sizing for the rest of my pieces and cut them accordingly. The overall square is 9"x9". I had a thin circle to go under the wood - I covered the cut edge of the opening with masking tape to keep it clean. Then I cut a thin chipboard frame that would layer on top of the solid square. 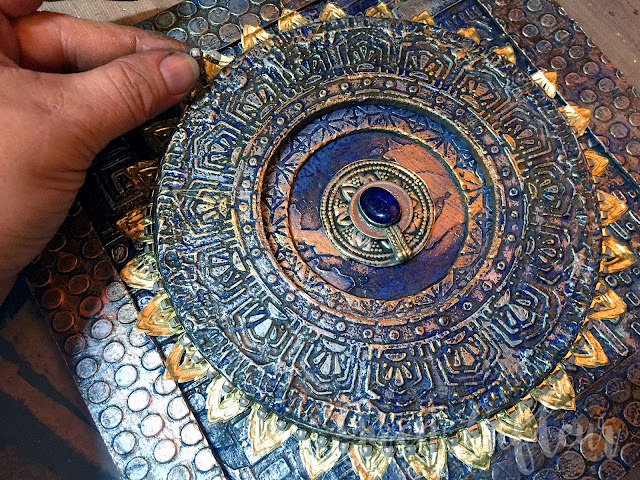 With all of my pieces cut to size, it was time to start building the texture. To get the effect I wanted in the background, I cut the 9"x9" background into 9 pieces, keeping them in order so I could reassemble them later. Then I used a different stencil on each of the pieces (except the center which was going to be covered completely,) and applied a thick layer of molding paste through each stencil. I set those aside to dry, then stenciled all of the frames. On the wooden circle, I also added a thick layer of paste around the edge with my palette knife. Around the frame I used the Fade Horizontal Stencil by Michelle Ward. On the small frame that would show through the center I used the Rose Window Stencil by Lizzie Mayne, and on the wooden circle I used my Art Deco Flower Medallion. Finally, I stenciled the eye from the 4x4 from May 2017 StencilClub by Pam Carriker on a piece of cardboard that would go behind all the circles. 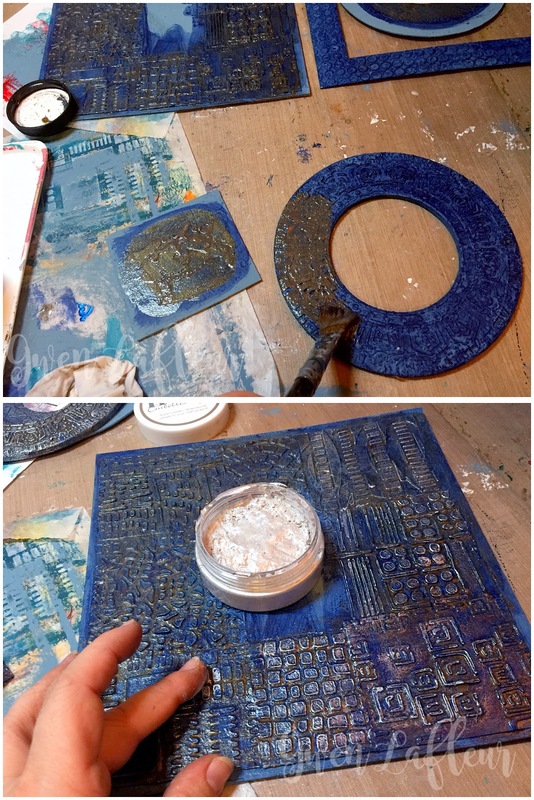 Once all of the paste was dry, I reassembled the background into one big square. I used Weldbond glue (any strong white glue or something like YES! paste would work,) and made sure to get a solid coat so that it would stick evenly and well. 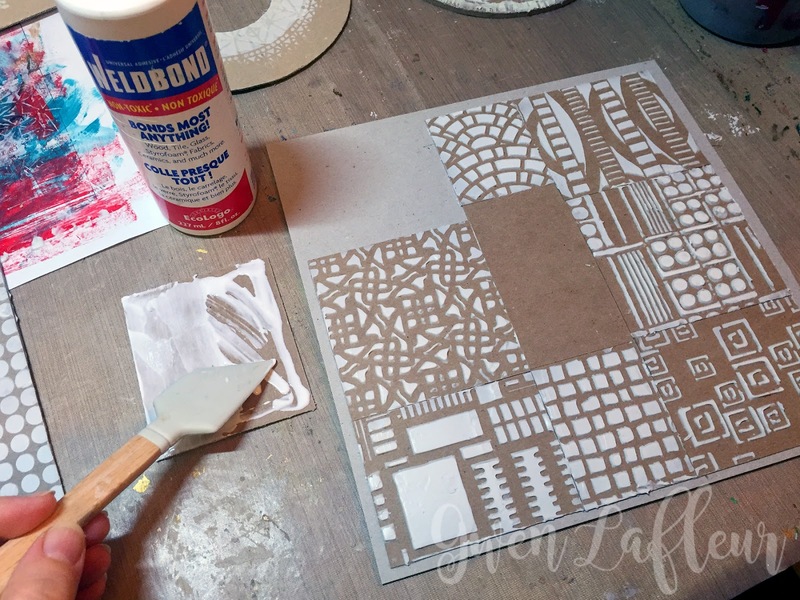 Next up, I used a glaze made with brown paint and glazing medium and put that on each piece, wiping back a bit of it after a minute or two so it was darker in the cracks but not solid on the high points - this helps emphasize the dimension from all of the stenciling. Finally, I used a variety of colored waxes and applied them with my finger, just catching the high points of the texture (I used Tonic Studios and Finnabair Metallique waxes on this project.) The colors I chose are platinum, aged brass, and a vintage gold. 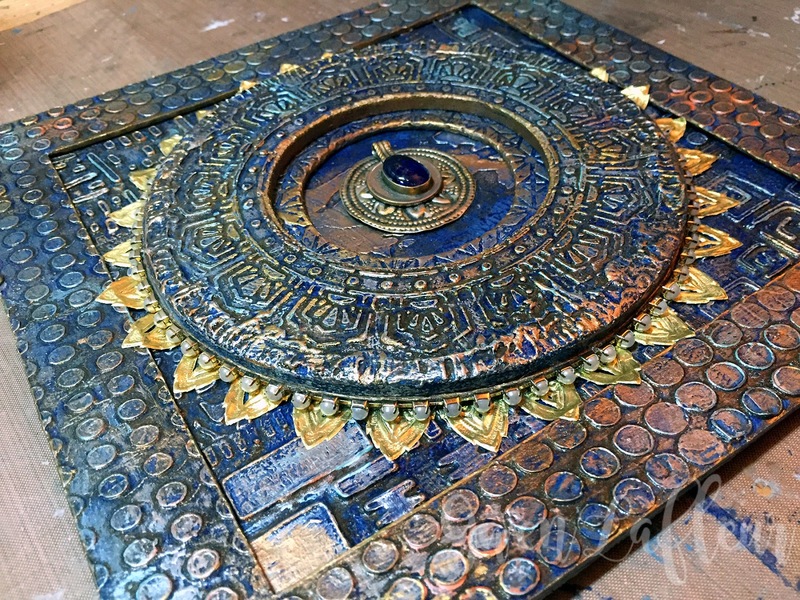 Once all of the paint was completely dry, I glued the frame onto the background - make sure to use a really strong glue to that it will stay connected with all of that texture in the middle. For the circles in the center, I took a long border of German Dresden Trim and cut part of it out (I knew it would be partly covered, so I cut the arched section off, leaving the circles to be used later) and placed that around in a circle on the back of my piece. Then I used Goop (or E-6000) to glue the whole center section down. Finally, I added some gold and pearl trim around the circle. Ready to become a book cover! 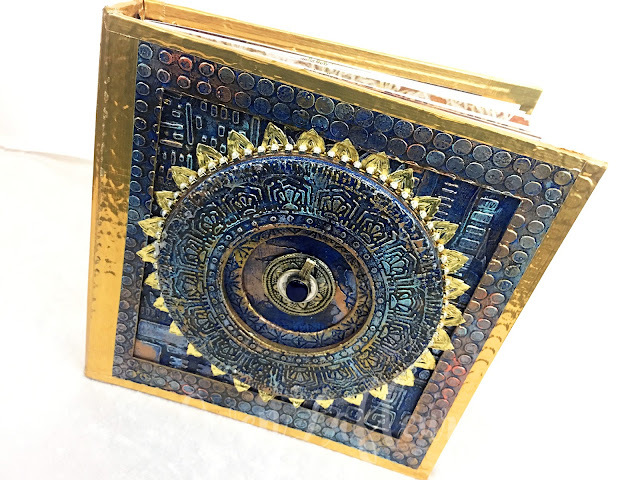 To do that, I went to my standby method for making my art journals - I made signatures with watercolor paper, patterned paper, etc... and then used the Codex binding to bind it all together. That works well for this project because it doesn't require putting any holes in the cover itself - just covering up a bit of the frame when I wrap the binding tape around the spine. Voila! A lovely new 9x9 art journal, just ready to be used! And there you have it! A fun, ceramic-inspired journal cover. Of course, it you could use the same techniques on a panel or other substrate. Couldn't you see this as a clock? 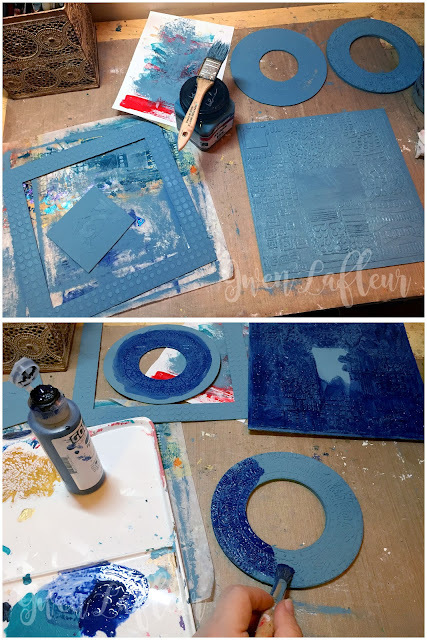 I hope you're feeling inspired to pull out your stencils and molding paste and start building some layers and texture! Absolutely stunning. And what a great tutorial. Thanks Gwen! Thanks so much Jessica! Much appreciated! You are an amazing artist Gwen and so inspiring. I learn something new from you in each of your tutorials. Wow! 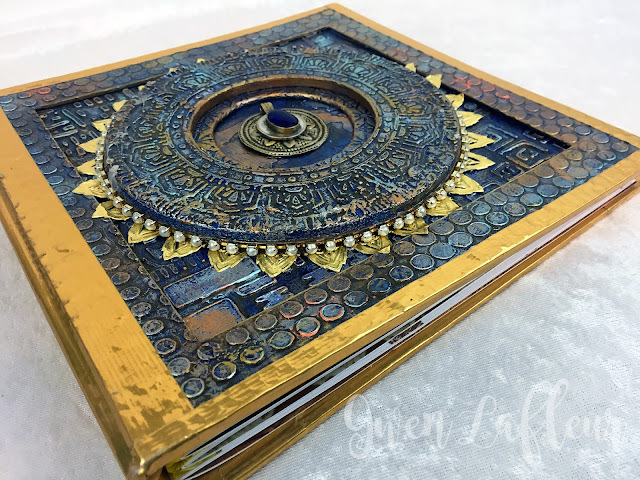 Texture-palooza on this gorgeous book cover Gwen! lol, thanks Carolyn! I was pleased with how all that texture worked together! This is really a work of art Gwen. 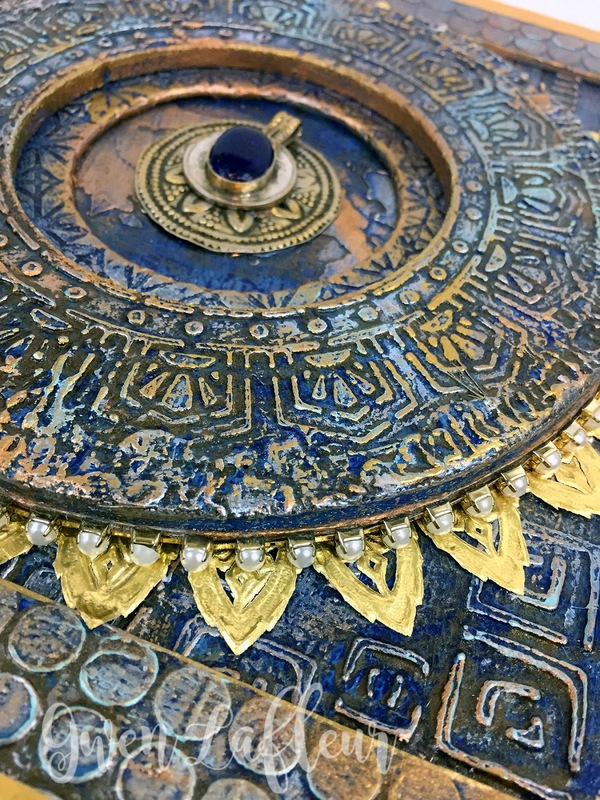 The feel of a gorgeous, ceramic relic. Thanks so much Seth! It was really fun to do and I'm very happy with how it came out!